To appease the youth of rural areas, the Bengaluru government has once again taken a positive measure. They have planned to provide free Wi-Fi in the rural areas. This is a step to ensure that the rural youth stays connected with the rest of the world. Free Wi-Fi up to 1GB: According to this new plan, the Information Technology Department will provide free Wi-Fi up to 1GB each month to the users. Within 1km square: If you live within 1km square of the service provider’s tower, then you will get this benefit. However, there will be many service providers who will have their posts across the area. 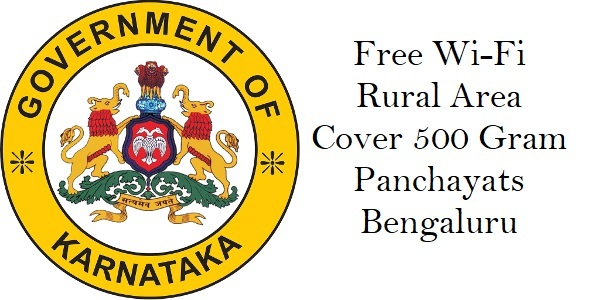 Gram Panchayats under the scheme: Under this scheme around 500 Gram panchayats are going to get this service in the first phase of its implementation. 316 more to get this benefit: Also, by the end of February, it is expected that 316 more Gram Panchayats (GPs) will join because they are already commercially live. Total beneficiaries: Taking the above Gram Panchayats into account, there are a total of 2650 panchayats that will get the benefit of this scheme. Service providers: For the 500 GPs the service provider will be BSNL while for the others CSC and SPV will be the prime service provider. Hardware provider: Keonics will provide the primary hardware support – that is, the original Wi-Fi to the service providers for this programme. Hence you can see them in effect all over the GP. Districts covered: To implement this scheme properly, the government has covered all 30 districts of the state and aim to provide them its benefits soon. Usage limit: After the 1GB per month limit, the user will have to pay Rs. 30 for every 5GB of data. One will then have to purchase them using recharge coupons. The IT departments will at first roll out the internet service to the Common Service Centres (CSCs) or the Seva Sindhu Centers ad in some cases the Bapuji Seva Kendra (BSK) as well. These centres will then appoint some front person to carry forward the services. Usually they will be some village entrepreneur or village local. To be one of those entrepreneurs you will have to register yourself will Keonics. They will roll out a list of paneled service providers and from that list the centres will contact the individuals for this service. These individuals will then help distribute the internet to the local people. This is one of the steps which will actually help generate rural employment while at the same time connecting rural India to the rest of the country. It is a welcome step that is seen as a beneficial one for Bengaluru.